I couldn’t really do this gift without including the Kindle. Opinion is divided on e-readers, but personally I think it’s one of the best gifts I’ve ever received, and I adore reading and ‘real books’. I would definitely suggest the Kindle paperwhite if your budget will stretch to it (purely as it’s designed for low light aswell as daylight); but alternatively the Kindle touchscreen would still be an excellent choice. Know someone who has a Kindle and misses the scent of ‘real’ books? Get them a ‘vintage bookshop’ scented candle! You could also get them a book cover case to make it look more like an actual book; how pretty is this Pride and Prejudice Kindle case? If you know someone who reads a lot of books and likes to keep a record of them, a Moleskine Books Journal is your answer. 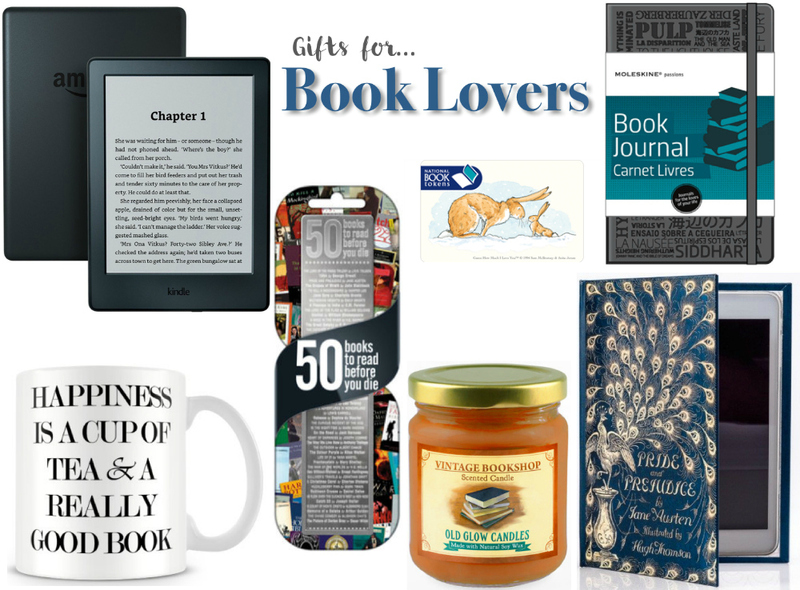 This would be a great gift if you know someone who is in a book club or studying literature, or even a book blogger. This a ’50 books to read before you die’ bookmark would be a fun challenge to set someone and will also be a nice keepsake – especially if they manage to read all 50 books! I love to read a good book with a nice cup of hot tea and I’m sure many other readers feel the same, especially in Britain as we love a good brew! I thought this mug with ‘Happiness is a cup of tea & a really good book’ written on it was really lovely, and as a huge book lover I would be happy as a clam to receive this as a gift. And if all else fails… give the gift of books! A National Book Token will allow them to pick up a book or two of their choice. Alternatively an Amazon gift card would be better if they are a Kindle owner. *All links correct at time of writing.